BUFFALO -- Subversive Theatre will team up the Buffalo Historical Society and the Buffalo & Erie County Public Library to present two evenings of staged readings of their award-winning original drama THE GUNS OF CHRISTMAS by Subversive Theatre's Associate Artistic Director Gary Earl Ross. 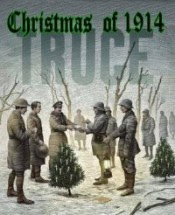 Originally written for Subversive Theatre to mark the 100 year anniversary of the notorious "Christmas Truce," THE GUNS OF CHRISTMAS went on to win the 2015 Artie Award for "Outstanding Original Play" and serves as a powerful tribute to the power of everyday soldiers to stand up against the war machine. The show will be presented at 6 p.m. Dec. 5 at the Buffalo Historical Society, as well as 6 p.m. Dec. 6 at the Downtown Central Library. The cast includes: Lucas Lloyd (Percy), Lawrence Rowswell (Thomas), John F Kennedy (Johann), J. Tim Raymond (Duncan), Justin Fiordaliso (Ernst), Kurt Schneiderman (John), John Profeta (Herman), Jacob Sauer (Rudolf), Michael Mottern (Willy), Rick Lattimer (Billy), Murry Galloway (Oberst/Colonel), and Gary Earl Ross (direction/ stage directions).